HOLLYWOOD, Calif. (January 3, 2013) - "One of the most memorable movie-going experiences of the year" (Richard Roeper, "Richard Roeper & The Movies"), the "keenly felt, knuckle-biting drama" (Lisa Schwarzbaum, Entertainment Weekly) Flight makes its Blu-ray, DVD, Digital Download and On Demand debut on February 5, 2013 from Paramount Home Media Distribution. 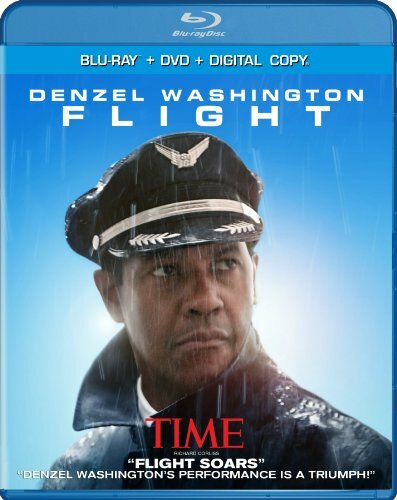 Hailed by critics and audiences alike, Flight is directed by renowned filmmaker Robert Zemeckis (Forrest Gump, Cast Away) and stars the incomparable Denzel Washington in a performance that "will be talked about for years" (Peter Travers, Rolling Stone) and has earned him Golden Globe(R), SAG and Critics' Choice award nominations. Written by John Gatins, the film tells the story of Whip Whitaker, a commercial airline pilot who miraculously lands a plummeting airplane during a breathtaking sequence described as "the hairiest, scariest, most realistic, and thrilling plane crash in movie history" (Richard Corliss, Time). But despite his heroics, Whip comes under investigation and begins what may be an even more harrowing personal descent. Flight also boasts an exceptional supporting cast including John Goodman, Don Cheadle, Kelly Reilly, Bruce Greenwood, Melissa Leo and Brian Geraghty. Flight will be available in a Blu-ray/DVD combo pack with UltraViolet(TM) and compelling special features that take audiences behind-the-scenes to learn about the film's journey to the screen, how the filmmakers created the terrifying plane crash, and more. In addition, the two-disc set includes highlights from a Q&A panel. The film will also be available as a single-disc DVD. All Blu-ray releases available for purchase will be enabled with UltraViolet, a new way to collect, access and enjoy movies. With UltraViolet, consumers can add movies to their digital collection in the cloud, and then stream or download them - reliably and securely - to a variety of devices. Paramount Pictures presents an Imagemovers/Parkes + MacDonald production: Flight directed by Robert Zemeckis. Produced by Parkes/MacDonald Production's Walter F. Parkes and Laurie MacDonald, and ImageMovers' Robert Zemeckis, Steve Starkey, and Jack Rapke. The executive producer is Cherylanne Martin. Original screenplay by John Gatins. Paramount Home Media Distribution (PHMD) is part of Paramount Pictures Corporation (PPC), a global producer and distributor of filmed entertainment. PPC is a unit of Viacom (NASDAQ: VIAB, VIA), a leading content company with prominent and respected film, television and digital entertainment brands. The PHMD division oversees PPC's home entertainment, digital and television distribution activities worldwide. The division is responsible for the sales, marketing and distribution of home entertainment content on behalf of Paramount Pictures, Paramount Animation, Paramount Vantage, Paramount Classics, Insurge Pictures, MTV, Nickelodeon, Comedy Central and CBS and for providing home entertainment fulfillment services for DreamWorks Animation Home Entertainment. PHMD additionally manages global licensing of studio content and distribution across worldwide digital and television distribution platforms including online, mobile and portable devices and emerging technologies.